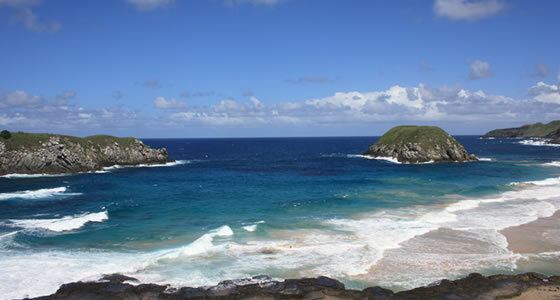 Praia do Leao Beach, Fernando de Noronha, Brazil. The Praia do Leao beach is also called the lion’s beach; it gets this name from a rock that looks like a profile of a sea lion lying down. Praia do Leao lies to the east of the island and is located beyond the Xareu Dam. The beach is also considered the largest aquarium for some rare underwater species. Beside Praia do Leao there is another rocky formation called the Viuvinha rock, which is a small island inhabited by birds and their nests. Access to Praia do Leao is limited by buoys and ropes and during certain seasons access is completely forbidden. This is because Praia do Leao is not only a mating and resting place for dolphins but also the main egg-laying ground for sea turtles. Hence it comes under reserved area with stringent control. Especially between the months of January and June, the beach is closed from late noon to early mornings, so ensure to check the beach time before you venture out. The beauty of this beach lies in its white sand and picturesque scenery. While on this bay, you get to see water jets during high tide, rotier dolphins and the remains of a fort- Bom Jesus do Leao along with the 13 partially covered canons.